Welcome to the four hundred and forty-third of my blog interviews with novelists, poets, short story authors, biographers, agents, publishers and more. Today’s is with novelist and non-fiction author, and radio host Jim Strait. A list of interviewees (blogged and scheduled) can be found here. If you like what you read, please do go and investigate further. Morgen: Hello, Jim. Please tell us something about yourself, where you’re based, and how you came to be a writer. After the military I enjoyed a thirty-year career as a professional pilot flying over one hundred different types, categories, and models of airplanes. In parallel, I operated a small business providing a variety of services to civilian companies and the military. After retirement from professional aviation, I transitioned into broadcast radio where I’ve hosted “Strait Talks” radio since 2006 in the Philadelphia Pennsylvania market. My professional writing career began in 2008, and came to be as a function of my having interviewed fortuitous “on air” guests, ultimately leading to their hiring me to write “Weird Missouri”. Since Weird Missouri, and after a couple of false starts, I released my most recent book, “Déjà vu All Over Again”, which is an action adventure novel taking place in the final 57 hours prior to the calendar turning 12-21-2012. My future projects involve the release of a third book, “Thomas Jefferson is Missing”. I’m also on the cusp of debuting a new radio format, Book Talk Radio, which will exclusively host authors, publishers, agents, marketers, and others associated with the publishing industry. Morgen: Wow, you sound busier after your retirement (my mum and I both say there aren’t enough hours in our days but I think most people feel the same whether retired or not). What genre do you generally write and have you considered other genres? Jim: To this point, I’ve written one book that is a hybrid collection of truths and fictions, and two fiction novels. I like fiction because there aren’t any limits to the direction or content of a story line. However, I want my next book to be nonfiction, and am waiting permission to begin a biography about America’s most dynamic cyclist, and it’s not Lance Armstrong! Morgen: Ah, you’ve got me there then as he’s the only one I can name… but then I only know our Bradley Wiggins because he’s just won the Tour de France (the first Brit to do so apparently). Have you had any rejections? If so, how do you deal with them? Jim: I’ve been fortunate. My first book was published traditionally, however, I was hired to write the book as an independent contractor. All I had to do was submit writing samples to the publisher, and then once given the go ahead, I merely submitted content under the terms of the contract. My novels on the other hand, are self-published. I like the sense of accomplishment that being an independent affords! Adding to that process is that I understand the marketing end of it, and given that I never sleep, time to market my work is always available. Morgen: Either way, very rewarding. 🙂 Do you have an agent? Do you think they’re vital to an author’s success? Jim: I do not have an agent, however, I would not entirely rule out such a relationship. I’m a notorious control freak, so, working independently may be a happier path for me. It would have to be a remarkable agent, encountering me on an unusual day… in essence; it would have to be a providential meeting. But I do believe that in some instances, agency can accelerate the journey, however, there are multitudes of ways to succeed. Humans are born engineers, and I like to engineer my way to succeeding in the face of those suggesting that such isn’t possible. I’ll admit that, at times, being a strong willed independent is not the most practical path to follow, but, for me it’s less stressful, thus, more enjoyable. Morgen: I’m the same (a control freak – just ask my brother!) and love doing every aspect of an eBook myself (although I do have an editor and first readers for the crucial content analysis). Are your books available as eBooks? Were you involved in that process at all? Do you read eBooks or is it paper all the way? Jim: Yes, “Déjà vu All Over Again” is an e-Book. 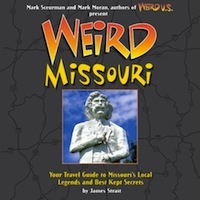 “Weird Missouri” is not, which is a function of it containing over 250 photographs and illustrations. “Thomas Jefferson is Missing” will come in all formats, just as “Déjà vu All Over Again” is available in hardback, soft back, and e-Book. Morgen: It’s very wise. Many authors I’ve spoken to have been selling more in eBook format than paper although only a couple of said they only read eBooks themselves. How much of the marketing do you do for your published works or indeed for yourself as a ‘brand’? Jim: I do 99% of the marketing, and what little I do not do is a function of me not having the technological savvy to make something work within the framework of online systems configurations. Not much of a computer guy, thus, on occasion I hire things done… websites, etc. Morgen: I’m fortunate in that I grew up with an older brother who’s very tech savy (I design inexpensive blogs for writers – I’ve done everything on this WordPress blog without it costing a penny)). I’m pretty sure I know the answer to this but did you have any say in the titles / covers of your books? How important do you think they are? Jim: I control all of it. Title and cover are vital. Humans are visual critters, and the cover needs to convey visually the implied content within the pages. A visual tease is how I think of book covers. Morgen: We are. We think in pictures. If I said to someone “Brad Pitt” or “Audrey Hepburn”, 99.9% (possibly 100%) of people would picture their faces rather than their names written down. What are you working on at the moment / next? Jim: Marketing is taking up most of my time at the moment. However, as soon as I get the go ahead on the biography, I’ll begin that process immediately. Morgen: How exciting. 🙂 Do you manage to write every day? Do you ever suffer from writer’s block? Jim: I do write every day, however, some days are more productive than others. Creating volume is vital from my frame of reference. Keeping forward motion happening, even if it’s content that is later removed, or that I wordsmith heavily…momentum in all things is critical. I do not suffer writers block in the conventional sense, but I do lose interest frequently. Thus, the need to write constantly, knowing that exercising the writing machine is just as important as exercising the body. When not writing, I’m riding my bike, and when riding my bike, I’m almost always composing a draft in my head. It’s an insidious loop of writing and riding… not that I’m addicted, but yes, I’m addicted to both. Morgen: When I drove my lodger to work (which I do 5.30am five days a week, 3.30am on Saturdays!) yesterday morning she said I was addicted to this blog… I think she’s right. The trouble (not really the right word) is that I get over 100 blog-related emails a day and if I don’t keep on top of them (to within a week or two) people start chasing me and I only get more frustrated as my inbox fills. Like anything, dealing with something on a regular basis (like housework – my back garden currently resembles a jungle – or a 100,000 word novel at 300 words a day for a year) makes it more manageable. Do you plot your stories or do you just get an idea and run with it? Jim: I like to think on my feet, I run with it. Writing myself into a plot line corner and having to engineer my way out is half the fun. Not sure what the other half consists of! Jim: Characters are easy for me, having been surrounded by so many for over six decades. Naming them is tougher, but I eventually settle on names that allow me to find comfort with them. Believability is that intangible that is also a make or break issue with any story. Writing from the heart seems to work best for me. Not holding back, letting them be darkly evil, or impossibly angelic, allows me to share with the world my multiplicities. Morgen: I love the sound of ‘darkly evil’. Do you write any poetry? If so, why do you think it’s such a difficult market to break into? Are there any tips you could give to someone wishing to write poetry? Jim: Many say that my ultimate demise will be poetic, but beyond that unkind event, I’m not a poetic person. Poetry is rare air, and not many people, in the grand scheme of things, think in poetic terms. It’s a tough niche that I’d never consider entering. Morgen: Me neither. I’ve written some but it’s certainly not a comfort zone. Do you do a lot of editing or do you find that as time goes on your writing is more fully-formed? Jim: I try to not look back when writing. It’s all about forward motion… momentum. Ultimately, I copy edit the hell out of the story, many times over. And yes, the more I write, the more fully formed I find the story. I’m less frequently going back to add elements that should have been there in the first draft. Writing, like all human endeavours, is a process… I’m still processing! Morgen: and practicing. Do you have to do much research? Jim: With “Weird Missouri” I spent eight weeks in state, drove 8,500 miles, visited hundreds of venues, interviewed hundreds of people, took 2700 photographs, and then sat down and wrote the book in three months. So yes, in that instance research was required. However, with “Déjà vu All Over Again”, the only research I had to do was discover the weight of the International Space Station (one million pounds for the curious) and over what part of our tortured planet the Space Shuttle had to initiate a de-orbit burn in order to land at Roberts Dry Lakebed in California (over the Indian Ocean, for the curious). I can’t imagine writing an involved story that did not require some modest element of research. We never know as much as we think… even the events of our own lives. Morgen: Absolutely, and there will always be someone who knows more about a topic than we do… and be happy to put us right. Do you have pieces of work that you think will never see light of day? Jim: I have a couple of false starts that I think will ultimately become whole. I’m still sorting out what it is about the work that I find lacking. I like a fast-paced story, and I think I just need to compress the time lines… we’ll see! Morgen: A book has to be a page-turner, regardless of genre, really doesn’t it. What’s your favourite / least favourite aspect of your writing life? Has anything surprised you? Jim: I like it all. As an artist, you get to be the boss. I get to make all of the rules, change them at my whim, or delete them if feeling self indulgent, or if I discover that it was just a dumb rule in the first place. No rules is my favorite part! If there has been a surprise it’s how prolific I think I can be. It seems to come easy and natural…we’ll see if it lasts. Morgen: I’m not a red tape fan either. I used to temp, staying no longer than one month at any one place, then I was offered a job at one of them and was there for a couple of years before they moved and I decided to quit and stay at home full-time… I love it. 🙂 What advice would you give aspiring writers? Jim: Never second guess yourself, always keep the forward motion happening, and realize that marketing is far more laborious than writing. Morgen: Isn’t it. It’s usually the answer to “what’s your least favourite aspect of writing”. Is there a word, phrase or quote you like? Jim: I like the word; “vacuous”… it’s so often applicable! Jim: I race bicycles on the track (velodromes), and play with my grandkids (5), they can be pretty tricky! Morgen: Ah, so children’s stories perhaps? What do you think the future holds for a writer? Jim: For this writer, my hope is a long and prolific career. For others, we’re all authors during an incredible moment of change within the industry. Man communicating with man is always going to happen, thus, writing will be with us always… or, at least some form of communicative interaction. I think in the near term, twenty-five years, writers will still enjoy the conventional process of creating books. Beyond that, books may disappear and be replaced by thought pills, or story injections. Hey, it’s possible! Morgen: Anything is… I often wonder where technology will go next and it’s usually an unexpected improvement. 🙂 Where can we find out about you and your work? Jim: I’d like to thank you for this very helpful and generous service! Morgen: You’re very welcome. Thank you for spending time with me today. I just love your blog Morgen. I am getting so much useful information. I hope I can get another interview with you. In November my new book, Angel in my heart, Devil in My Soul, the second in my angel series will launch. I hope you can find another spot for me.